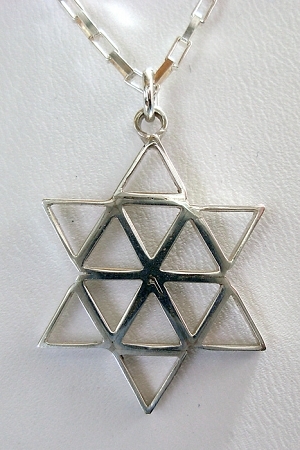 Religious Judaic Jewelry - This is a modern sterling silver Star of David pendant that symbolizes twelve tribes. This Jewish star necklace is large size and comes with an 18" sterling silver Figaro chain. This charm is also available in 14K yellow gold. Star of David. Sterling silver charm is on a 18" sterling silver chain.